Ornamental polypropylene UPVC decorative louvred shutters in a variety of different styles and colours. Scroll down to see more information on this product. All shutters are supplied with the fixings to install them. WhiteBlackEbony GreenPine GreenSage GreenLunar BlueBedford BlueColonial BlueCranberryBordeauxBrick RedTerracottaChestnut BrownSienna BrownSandalwoodPotters ClayDove GreyPaintable ? The most common and popular style of shutter that can be found on homes today is the Louvre Shutter. 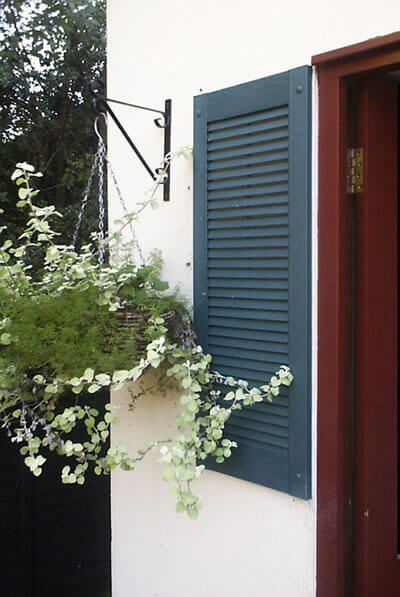 There are many shutter styles to choose from and it is not uncommon to find shutters that have been custom built to incorporate designs from other styles of shutter; for instance a combination of louvre and flat panel. 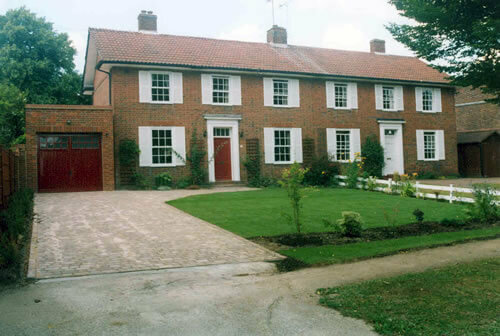 Traditional Louvre is the name that we give to any maintenance free UPVC louvre shutter that we have to custom build for you. There are many designs to choose from within the Traditional Louvre range and, as all the louvre styles are the same price, you will be free to opt for the design that you like best rather than be restricted by cost? Traditional Louvre shutters are available in a huge choice of widths from 7 inches wide up to 18 inches wide and in 17 different decorator colours plus a paintable option. All self coloured products cannot be painted. 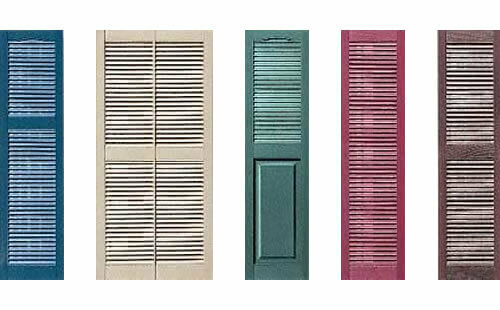 This large choice of widths and colour options will give you the versatility to choose a shutter that will not only meet your requirements but also give you various solutions to installation difficulties that you may face. Offset rails are usually used where there are windows of a particular design or architecture that will be enhanced by the offset rail. You can use the offset bar to great effect to take the line created across the window by the top closures / transom onto the shutter to create a truly custom built appearance. We have had wooden louvre style shutters on the front of our restaurant for over 20 years and this year they decided to show their age by falling to bits. We found simply Shutters by doing a Google search, did a fair bit of reading and then decided to order 3 pairs of UPVC coloured shutters. We were surprised when two small pieces of shutter arrived ... Read More in the post and we were asked to confirm the colour. I'm so glad they did as the colour we chose was far to light. 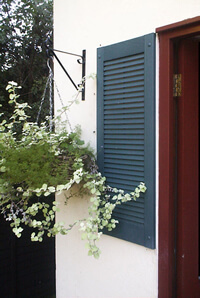 Simply Shutters build almost all Traditional Louvre Shutters shutter options in our own workshops. As a result we provide a fast dispatch schedule of between 12-15 working days after placing your order (we never count the day the order is placed). We frequently build and dispatch orders much faster than this but as orders are built to client specifications, please allow this period for your new shutters to be constructed and packed ready for dispatch. One or two colours that are available are not built onsite and therefore delivery times on these colours will be extended. Should you order be affected we will notify you immediately.